Chlorella has an amazing balance of nutrients that cleanse, alkalise and protect the body with a special focus on supporting immunity. It's ability to capture natures energy gives it a unique nutritional profile including a high chlorophyll content which is useful for cleansing. it is also high in chlorella growth factor, a special compound know to support the immune system. It is one of the most nutritionally dense foods in the world filled with antioxidants, amino acids, proteins, essential fatty acids, vitamins, minerals and nucleic acids. 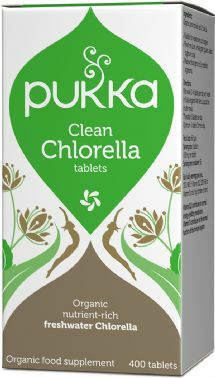 First week 2-4 tablets per day with water or Pukka Organic Aloe Vera Juice before or after meals. Thereafter 6 tablets per day. Optimum 6 tablets 3 times a day.Seek professional advice during pregnancy. Soil Association certified 100% organic, ethically sourced, suitable for vegetarian and vegans. 100% pure organic chlorella (cracked cell).